With a busy work life, it might seem hard for you to hit the gym and get your needed exercise. You don’t want to fall behind on your work so what can you do? 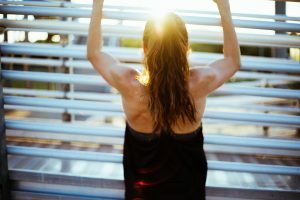 Well, today I bring you a few workouts that you can do at your desk in order to get your exercise in throughout your day at work. Remember, you’re at work and you might look goofy so try not to do these in front of your boss. But if possible, try to get a few of your coworkers to try it out with you and wait for results. On average, most Americans get about 7.5 hours of sleep after an 8 hour work day. That’s 15 hours that you are sitting in one day. That’s why it’s important to maintain circulation and stretch out your muscles. Want some good stretches for your desk? Try simple things like reaching for the stars, standing up and shaking off the dust, or even doing forward leg stretches. Try stretching your chest out by pulling your hands back and stretching forward for sets of 10 seconds. Another good stretch is simply knee raises for 5-10 seconds. When getting into actual workouts, a simple one to do is squats at your chair desk. Do this 20-30x standing up and sitting down in your chair. If you feel the burn, its working. If your desk is big enough, try doing knee raises to your stomach for 20-30 seconds. This will be a great lower ab workout and get your heart rate pumping. You can always “Jump rope” in place alternating between each foot. Find a heavy book (just something with weight) and hold it at shoulder height for shoulder presses. This workout can build up the muscle around your arms and doesn’t look so awkward from your desk. If you want something you can do subtly, try lunges from sitting at your desk. Take one knee and stretch it out until it touches the ground. do this anywhere from 10-20x for each leg. Do simple, subtle things that help you get active like parking further away so that you have a longer walk to the office. Take a stroll outside to relieve yourself from too much desk time. Stand up and just stretch. When getting a phone call, make it a habit to stand up and stretch out while on the phone. Whenever you can get small quick workouts in, do them. As long as your moving and out of your seat, you will be able to slowly get more movement out of your day at work. It’s important to take the healthy options available to stay in good shape. Insurance is one way you’ll be able to stay on top of things. Since insurance is often times overwhelmingly confusing, we want to shed light on this industry by answering YOUR questions. So if you have any questions or concerns, comment below and your question may be the topic of our next video!